This article (attachment IMSconstruction031609) published March 16, 1909, in the Indianapolis Star, reports that the contract for grading the Indianapolis Motor Speedway racing surface had been let (another article elsewhere on First Super Speedway reports the winning company was King Brothers Construction) and the 35 men had immediately started working on the project. This article was published in the March 21, 1909 Indianapolis Star and reported on the visit of one of America's top race car drivers, Lewis Strang and his visit to the Indianapolis Motor Speedway the previous day. This article, published in the Indianapolis Star on April 18, 1909 offers some interesting details about the construction of the Indianapolis Motor Speedway not commonly known or frequently discussed. The attached article was originally published in the May 22, 1909 Indianapolis Star and reports on the very first lap taken by an automobile at the Indianapolis Motor Speedway. The man at the wheel was Speedway Founder and President Carl G.
The attached article originally appeared in the June 27, 1909 Indianapolis Star. It provides insight to the views of Herb Lytle, one of the most experienced drivers of the day, concerning the Indianapolis Motor Speedway that was still under construction at the time. This article originally appeared in the July 24, 1909 Indianapolis Star and is somewhat rare in that it attempts to provide some analysis of the Indianapolis Motor Speedway as a business. Back in these days one million dollars was almost unfathomable money. The article suggests that when everything was done the collective investment of those involved with the August opening of the Speedway for motor racing would exceed that figure. The articles in the attachments below discuss a debate about including a saloon on the grounds of the Indianapolis Motor Speedway. The article in attachment IMSNews080609i was originally published in the August 6, 1909, Indianapolis News, and the other (IMSbar080809) appeared in the August 8, 1909, Indianapolis Star. This is an interesting article that sings the praises of the state-of-the-art timing, scoring and communications system installed at the Indianapolis Motor Speedway for its first motorized events in August 1909. Published in the Indianapolis Star on July 18, 1909 the article tilts its focus toward anticipation for the inaugural automobile races. The attached article about the first announcement of plans for the construction of the Indianapolis Motor Speedway. 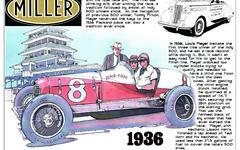 It was published in Motor Age on January 21, 1909, and was contributed by First Super Speedway reader Alan Saters.